This is a complete walkthrough for the Senior Detective level, but will work for Junior Detective also. A few of the puzzles will be easier to solve in the Junior level. We will not include solves for all the puzzles, but if you are having particular difficulty with a puzzle please write and we will help. We also have many saved games in case you need one. The tutorial can be helpful if you are not familiar playing Nancy Drew games. 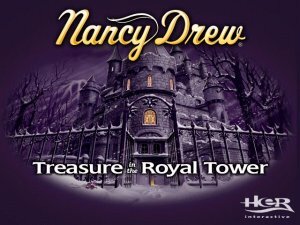 Linda and I have enjoyed playing the Nancy Drew games since the first one, Secrets Can Kill came out, and look forward to each new Nancy Drew game. Nancy Drew 5, The Final Scene will be coming out this November! Nancy is on a ski vacation staying at the Wickford Castle in Wisconsin. Christi Lane, a friend of Nancy's father, owns the castle. A blizzard swept in and closed the mountain and ended her plans for skiing. Nancy finds other ways to keep busy. The game starts with Nancy writing a letter to George. It goes into your inventory so you can mail it when you get a stamp later. Pick up your room pass key from the desk. Rm. number 205. Look at your locker card in the desk drawer. #310 with the combination 5-1-7. Take the menu from the top drawer of your dresser. Open magazine on the table and read how to get fingerprints. Check phone messages. Walk over by the radiator and notice that it must be broken. Open your suitcase and read the brochure. Exit your room and head downstairs to talk with Dexter Egan, the hotel manager. You can ask about the stamps and he will take your letter, but if you forget don't worry, it isn't crucial to the game. Talk to Dexter and exhaust all the conversations. Especially talk to him about the library and offer to help him. He will give you a chore to do. The ski rental office is open 9am - 12pm and 2pm - 5pm. You will pass by Lisa on your way down the spiral staircase to the basement. Talk to her about everything. She will tell you that Dexter keeps an extra Library key around his desk. (I wonder how she knows.) While you are in the lounge, read the 2 books in the bookcase. If the ski rental office is closed, pick up the little paint brush on the door ledge. Try out your locker and notice the combination doesn't work. 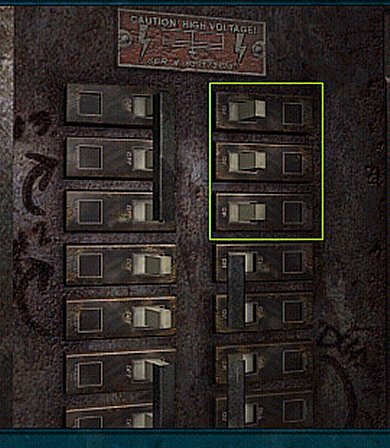 To open the locker: Turn the dial to the right until you reach 5, then click on the dark triangle above the number. Turn the dial to the left until you reach 1, then click the triangle again. Turn the dial to the right until you reach 7 and click the triangle once more. Pass the time until 2 pm when the office opens again. Talk to Jacques twice. Locker 310 won't open with the 5-1-7 combination. Open locker 311. Learn about Lisa's secret identities/passports, ID's, etc. Also learn that she speaks fluent Spanish (unlike she said earlier). Go up the elevator to Professor Hotchkiss's room, #214. Return the boots to Professor Hotchkiss then take the elevator back down to talk with Dexter. [To return the boots, place them in the hall in front of her door. As you turn and walk away you will hear her open the door and take the boots.] You will get stuck in the elevator and the emergency button doesn't work! Turn around and look up for a way out. Jumping across to the metal ladder along the wall is a little risky, perhaps you can find another way. After you get back to the hall head down the stairs to talk with Dexter and let him know the elevator is broken also. 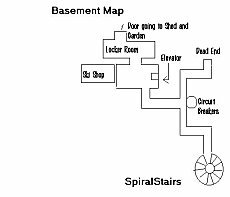 He tells you that the lights in the upper spiral staircase are out and asks you to check the circuit breakers. Move the top 3 levers on the right as shown in the picture below. To reset the elevator, notice the elevator control box on the left side of the circuit breaker box. There is a lever to reset the elevator there. Pull it down. After you have the oil can you can do more snooping. Set your alarm to 8pm. Take the elevator to the basement and climb out. You should hear noise that sounds like sawing. Nancy will mention something about a strange noise. Turn around and look down. Nancy will say something about a strange noise coming from down below and that there is something important down there. While you are down in the basement climb up the metal ladder against the wall. When you are near the top you will notice a grate that is falling off and an open vent. Swing across to the vent and crawl through it until you come to the grate leading into the library. Open it and jump down. As you start to go down the stairs you will hear the sound of someone coming. Quickly turn around and get back into the vents. Watch Dexter type in the code for the alarm and search the library. When he is gone you are safe to go back in the library. Look in the desk and read An Atlas of the United States. Note the longitude of Wisconsin is 90 degrees West. Notice the dust on the top of the desk? Use the paint brush on the dust and then use that on the alarm key pad to figure out the code. (3, * , 7, 2 ) Try it out! If it says approved you have it correct. Find the globe and move the needle to the longitude you found in the atlas, then click on the top knob to open it. The paper inside has the clue for the compass puzzle found behind the plaque above the fireplace. (-15, 10, -5) Move the compass to each number and every time you move it click on the green top button. When you do this successfully you will hear a creaking, squeaky sound as the door to the secret room upstairs opens. Before you rush up there, take a look at some important books. One is the book on Marie Antoinette lying on the floor written by Professor Hotchkiss. The other book you MUST read is the one about Marie Antoinette's Famous Portrait that is on the small table to the RIGHT of the spiral stairs that lead up to the Secret Room and/or Vent shaft. This BOOK is what "triggers" the close up for the Purple Rose in the Portrait in the Tower. Go up to the secret room, pick up the lighter and use it on the candle to get an ornate key. Read the letter next to the candle. Turn around and read the two books about Dexter, one good and one bad. You can now leave the library from the main doors without getting caught. Now it is time to see where that noise is coming from beneath the elevator. Go to your room and set the alarm for 8 pm. Go back to the 1st floor Library. It is easy if you are using the elevators. Make sure the elevator is on the 1st floor and you have the oil can in your inventory. If you don't have the library key you will find it in a drawer on Dexter's desk. You will need that too! Open the door to the library and the alarm will go off. Quickly go forward two steps then turn and head to the alarm. Push the buttons 3, *, 7, 2 and the alarm will go off. Go up through the vent and climb down the ladder to the bottom of the elevator shaft. You will hear "strange sounds from below." Turn around and find the lever that is stuck. Use the oil can on the lever and open that grill. Go down the stairs and turn left toward a door with six sliding locks. The combination will change each time you want to open this door. Follow the hall around to the left where you hear the sawing noises. Confront Jacques,"don't you think I should be asking YOU that question?" "What happened to the medallion?" "So, how do you know all of this?" "What did he think the journal contained that was so important? "But how do you think the medallion fits in?" "Well as long as you tell Christi…." Turn and get the sword tip from tin soldier. Go up the stairs, through the passage. Go back to the Basement and open Jacques locker. Look at the letter from his fiance', read the Diamond Chart and the Immigration letter, get the BLUE MEDALLION. BONK! Answer the phone in your room. "I don't know what really happened." "It was the last thing I saw..."
"I am afraid I am serious..."
Listen to your voice mail. Set your alarm for 8am. Go downstairs to talk with Dexter. Be truthful with him about the dirt on your shoes. Ask about the garden and the place his father used to go to think. He will tell you there is a key in the shed. On your way out to the shed if you meet up with Lisa don't reveal too much. Be careful about giving her too much information. Go through the locker room to get outside. It is very cold and you are starting to freeze. When you enter the shed go down the stairs and then turn to your left and go toward the work benches. The key you are looking for is on the peg board near the screwdrivers. There is also a newspaper clipping and instructions for the ski lift machine. Do this quickly and then leave and go back to the castle. To find the Secret Garden leave from the locker room again, take 3 steps forward and then click on the NO Trespassing sign. Go forward just to the left of that sign. Again you are getting cold so you must not take too long. Go to the vine covered wall and open the gate. Go forward and then left toward the sundial and a statue in the wall. Turn the sundial to the left to move the head of the statue. Go to the statue and pull the lever in back of the head. Take the box out and use the ornate key to open it. Take the RED MEDALLION. Quickly turn back and leave the garden before you freeze! Talk to Lisa. She will tell you that she saw Dexter carrying some green ornament outside by the shed and that you should check it out. You don't see anything and when you try to get back in the castle you are locked out! Hurry over to the shed and start up the ski lift machine. Set the levers according to the diagram 3.0, 2.0, and 4.0. To start the ski lift click on the middle lever once and the right lever twice. Dexter will come out to see what is wrong and help you back inside. If you can't get Lisa to tell you about Dexter carrying something green outside by the shed go up to your room and listen to your voice mail. Her message is the last one and it will say something about wanting to be friends and to see her because she has something to tell you. When you are back safely, go to room 214 to talk with Professor Hotchkiss. She will give you a question to answer. If you need to find the answer look at the books in the lounge bookcase. Once you answer her question correctly she will tell you to meet her in the lounge between 3 and 5:59 am. If you don't know the answer to the question, knock on her door again and ask her to repeat the question. She will give you another one. Go to your room and set the alarm for 3 am. Meeting Professor Hotchkiss. Talk about her theory of Marie Antoinette. She will give you a copy of her room pass key and let you know that you can inspect her room while she is in the lounge from 3am to 5:59am. You have plenty of time now so go up to her room and check it out. Read her notes next to the typewriter. Open her briefcase and read the letter. Move the pillow on the couch and get the BLUE MEDALLION. This time you don't get BONKED. Go over to the dresser and watch the video on her recorder. Place the battery pack on the recharger and come back the next night to watch the remainder of the video. Go back to your room and set the alarm 8am. Go out to the shed and retrieve the GREEN MEDALLIONwhich is on the machine to the right of the ski lift machine. Don't let the rat bite you! Return to your room, call your friends and listen to your voice mail. Set your alarm for 3am so you can visit Professor's room again and watch the 2nd half of the video. After viewing the last part of the video leave her room and turn right to the very end of the hall where you will find the circular room with the peep hole. Peep through that hole with each medallion and notice the location of the symbols. Red is to the left, Blue is to the right and Green is below and center. Time to go to the ROYAL TOWER. 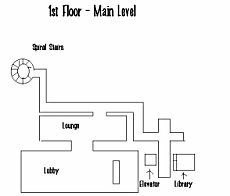 Take the elevator to the first floor, enter the library, deactivate the alarm system, go up the stairs, through the vent and down the shaft to the room under the Basement. Solve the door puzzle yet again, and then use the Skeleton key on the rod iron gate, but not before you get the spear tip from the Tin Soldier. To solve the Chain Puzzle, turn around and look at the plaques on the wall opposite the chains. The chains should be in that order. By pulling each chain, it not only activates movement of that particular chain, but also one other chain. It is not very difficult, really, but I managed to solve it by: clicking on 1, 2, 3, 5, 2, 4, and 1 (from left to right). Once you have solved the Chain puzzle, you need to move across the stepping stones. Go left down the hallway and you will come to what looks like a chess board. The idea here is to move the 4 pieces around the board until each lands on top of their corresponding square. Place the blue one first, yellow next, then pink, and finally the white one. This opens the stairway all the way to the top of the tower. 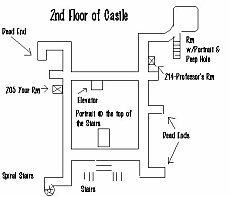 [saved game titled SR.Tower 1st time] Go up the tower and open the door, walk forward several steps and click on the GOLD LEAF puzzle on the wall. You can turn each individual piece when you put your arrow cursor in the upper left corner and get a curved cursor. When you solve this puzzle you will be able to open the secret compartment. Get the Journal. Look at Marie Antoinette's portrait. Look at the floor in the middle of the room. The medallions fit nicely but there is something missing in the middle. Return to your room and set the alarm to meet Prof. Hotchkiss in the lounge. Ask her about the translations you saw through the peep holes. Give her the journal. She says she will wrestle you for it, but you say that is not necessary as long as you can have the translation. She agrees and says she will have it by this time tomorrow night. Time to relax a little and just set your alarm again for 3 am. Go down to the lounge and talk with her. She tells you that she translated the entire journal and as an extra bonus it includes Marie's official decoder. Go up to her room to read the translation which you will find to the right of the typewriter. Look at the decoder which is to the left of the typewriter. Time to get back to the tower! Place the medallions with Red on left, Blue on right and Green at the bottom. Go to Marie's portrait and you should get a highlighted cursor on the purple rose. Did you read the book about Marie Antoinette on the table near the spiral staircase in the library? Did you give Prof. Hotchkiss the diary you found in the tower and ask her to translate it. Did you later read the translation and also the coder page? The coder is to the left of the typewriter. When you look at the decoder Nancy will say, "Purple Rose holds diamond key of Queen!" When you looked through the peep hole, did you look through with each of the medallions? Do you have the medallions in the proper order? Red left, blue right and green below. Use the tip of the spear to chip away at the portrait and you will get a key. Place the key in the center of the medallions. The middle of the floor will open and a pedestal with the diamond will come up. The diamond thief will also appear and spray your eyes with pepper spray. [saved game: ENDING] As the thief tries to run down the stairs, quickly find the square stone button on the left side of the wall of the stair well and push it. You will trap the thief! Nancy has solved another mystery! This document may be freely distributed by any means as long as the content is not altered in any way and reference/links are provided to this site.